When the Boston Bruins hosted the Philadelphia Flyers for the 2010 Bridgestone NHL Winter Classic® on New Year’s Day, a suite of advanced fiber optic transport solutions from Telecast Fiber Systems was instrumental in bringing the action home to television viewers. The Telecast gear enabled a seamless fiber optic link for delivering high-quality live video feeds to an offsite location for outside broadcast (OB) vehicles, 500 yards from the Fenway Park venue. The NHL Winter Classic was televised by NBC and carried by numerous other national and local media outlets. 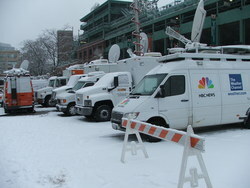 Staging a hockey game in a historic baseball field created a unique logistical challenge for the broadcasters, since the area just outside the stadium usually designated for broadcast trucks was occupied by ice-making equipment. Besides adding an additional 500 yards to the distance from Fenway’s cross-connect A/V access point, the offsite truck location was separated from the stadium by busy Van Ness Street. Thistle and Ed Jacobs, president of Interstate Rentals, another production equipment provider, worked together to devise a solution using lightweight fiber optic tactical cable to provide an overhead connection between the OB trucks and the cross-connect point inside Fenway. Telecast’s http://www.telecast-fiber.com/audio_overview/ [DiamondBack II ™ and Adder II™ systems were used for SD video and analog audio transport to the truck compound. In addition, Telecast’s Viper II™ and Rattler™ modular transmit/receive units provided HD/SDI video capabilities as required. NBC, ESPN, Comcast, and several local Boston and Philadelphia stations all took advantage of the fiber link to access live shots from the game. Thistle Communications was founded to offer unparalleled service in every phase of television remote production from concept and design to multicamera production, lighting, sound, staging, and satellite and microwave transmission. Thistle’s staff has more than 75 years of combined experience in major market and network television news, sports, special events, and corporate production. For more information, visit http://www.thistlecommunications.net. Telecast Fiber Systems, Inc., a Belden brand, is a leader in portable and fixed fiber optic systems for television broadcast production. The company’s video, audio, and communications systems are used worldwide by TV networks, teleproduction companies, sports venues, and various private, educational, and government and military organizations to extend range, simplify cabling, and reduce labor costs and set-up time. Telecast systems accommodate all television production signals, including NTSC/PAL video, SDI and HD/SDI video, analog and AES/EBU audio, HD and triax camera interfaces, and intercom and data signals. More information can be found at http://www.telecast-fiber.com. All trademarks mentioned herein are property of their respective owners.